Legend has it, the Panama hat was so named because President Teddy Roosevelt had returend from a visit to the Panama Canal and raved about how much he liked a hat he picked up locally. Thus the name for the straw made hat was dubbed the Panama Hat. Today the best Panama hats are hand woven in Ecuador by master weavers, a skill that is passed from generation to generation. Much like skilled cigar rollers, these master hat weavers have spent much of their lives honing their skills. Today there are many brands of this fine hat. Most brands grade the quality of the hat into three categories. Super Fino Grade: Quality typical of a Grade 5-8 straw. 500-800 weaves per sq. inch. Optimo Grade: Quality typical of a Grade 9 and up straw. 900-2000 weaves per sq. inch. No, straw hat will last foever, and most Panama's can last from 1-10 years depending on wear. The most common issues for the breakdown of the straw comes from the straw drying. Never store your hat in direct sun and never pick the hat up by its top. This bad habit will bread down the crown and you will loose the shape. Never pinch the crown and when handling, hold the hat by the brim. 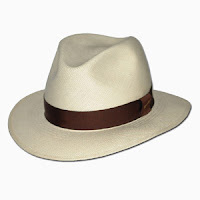 If you start to get sweat stains on your Panama hat, a mix of lemon juice and water sprayed on the hat and then allowing the hat to sit in the sun for a few hours will sometimes bleach the sweat stain out. Most importantly, the use of a wide brim hat WILL help prevent skin cancer. Why not look slick while taking care of yourself? I wear my anytime I go outside. Cheers from the Panama Hat wearing Hobbit.